At the restored Hope pit at National Mining Museum, Caphouse near Wakefield, Yorkshire, new surface displays etc have been opened and the underground visit guided by ex colliers is free to all above 5 years of age and access to certain parts by wheelchair users. 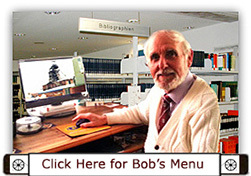 I have visited it 5 times to press and noted something different of value on each occasion. The museum should be visited by everyone if possible, particularly wives and daughters of miners as it portrays the working conditions of coal miners from pre 1840 up to present day. 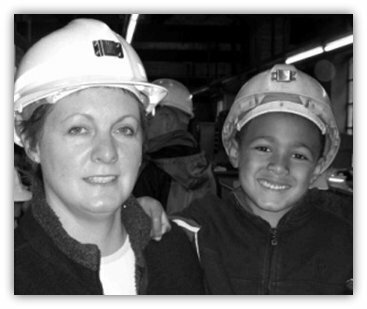 Pictured are my daughter Jane and grandson Gabriel on a visit to the mine in 2005. There are several types of cutting/heading machines on show and a short coal face is set up with hydraulic chocks. The shaft is 146m deep and there is an adit at 1in3 gradient from the surface that serves not only as a fresh airway but as an emergency exit. On returning to the surface one can tour the surface installations and artefact displays then settle down to a proper Yorkshire miners’ dinner, complete with Yorkshire pudding in the excellent canteen. I have visited the mine on a couple of occasions in 2012 and 2013 and have been privileged to have been escorted by the Manager Willie McGranaghan (11633) on his inspections of roadways not accessible to the public, the last time accompanied by Dr David Amos (PhD 2012), Lecturer and ex UDM Secretary at Annesley and Paul Fillingham Photographic Designer in order to set up a filming exercise underground. In June 2015 I escorted a friend Dasenko Pajovic (a Montenegran) on an underground tour. Having never been down a mine before he was fascinated by the experience. 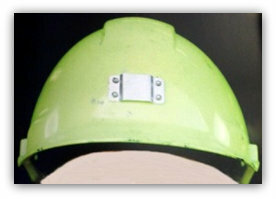 Field trials were taking place in July / August with a newer lightweight light green helmet encompassing ear muffs etc as the old type of helmet has not always been compatible with the ‘added extras’ of the past. Welbeck (Nottinghamshire) was the latest pit to use the new style fire barriers. Lightweight bags made from isotropic plastic and containing 6 kilograms of stone dust are hung from the roof of the roadway and in the event of an explosion respond to a low pressure wave and burst showering the roadway in dust, thereby cutting off the oxygen that fuels a fire. The idea introduced last year at other collieries saves time, effort and money in replacing the traditional stone dust barriers. They have earned the nick name ‘dust bats’. All the coal in the New Year was to come from 2 faces, one advancing and one retreating in the Deep Soft seam. The last short length retreat face in the Parkgate finished in Oct 2005. 5th September 2005, another possible takeover of UK Coal, this time from funds advised by Alchemy Partners, Morston Assets Ltd, the property management side of Sir Tom Farmer and the Buccleuch Group, (for the land, not the coal?) An approach had first been made in April but the talks terminated. UK Coal Chairman David Jones stated that a meeting had been arranged following issues received being clarified. Severn Trent opened a system to supply methane created from human waste at Stoke Bardolph sewage works to the National Grid. This would be used to create sufficient power for 4,500 homes. The gas otherwise is allowed to ‘escape’ into the atmosphere. Unfortunately this is another source of fuel not requiring coal. The idea will undoubtedly spread to all works in the future. Power generation was first used at Minworth sewage works near Birmingham in 1969. A delegation of 6 miners from Harworth, Thoresby and Welbeck (Nottinghamshire) travelled to London in mid September 2005 to meet with the Energy Minister Malcolm Wicks MP (Lab) at the Department of Trade and Industry regarding the possibility of opening a new seam (Barnsley Bed?) at Harworth. John Mann MP (Lab) for Bassetlaw who accompanied the party said his next step was to visit Brussels where he hoped to discuss the possibility of a partnership between the Government and the European Union to encourage investment in the coal industry. The rise in energy prices of oil and electricity in September 2005 boosted Alcane Energy. The firm based at Edwinstowe collects methane gas from 7 old colliery sites in the UK including Shirebrook, Bevercotes, Markham and Mansfield. The firm’s two newest sites at Mansfield Woodhouse and Whitwell have a combined generating capacity of 2.7 megawatts. The other sites generate 5.4 megawatts. The electricity is fed into the local grid for domestic supplies. Chief executive Dr Cameron Davies. A number of sites previously mothballed because of a downturn in the UK market are now on standby. However this is another source of fuel to replace coal supplies from the local pits albeit the gas is from local closed mines and with it of course the lack of jobs as in the past. Messages flashed on a screen in the gate announcing that the face machine was approaching the gate end warning everyone not to enter the area until it was safe to do so. Technology had increased so much so that Colliery Managers were now able to see where a face machine was cutting on a coal face on a computer screen in his office. In some respects...’Big Brother.’....no hiding place and no more lame excuses ... it was there for him to see... The new breed of cutting machines coupled with stronger AFCs, face lighting and 2 leg chocks that moved over remotely as the face machine passed by enabling just 2 men to produce hundreds of tonnes of coal in one pass on a face where 30 men stinting was necessary in the 1950s. Adverts in Mansfield Chad 2/11/2005 for Weekend Officials at £13.88 per hour for 6pm to 6am Saturday and Sunday and Underground Craftspeople £431 per week plus bonus for M&Q Class 1 or 2 for 7 nights on and 7 nights off shift system. Have they all left? 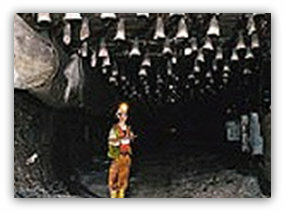 Cuts in staff at Harworth HQ of UK Coal were necessary now that further closures are announced Harworth (Nottinghamshire) and its neighbour Rossington (South Yorkshire) to be mothballed by January 2006. The mothballing process is thought to be prudent due to the volatile energy market at present. However foreign coal was flooding into Britain at the rate of 40m tonnes per year from Russia (15mt), South Africa (11.3mt), Colombia (3.6mt), Indonesia (1.3mt) and Poland (1.1mt) and a substantial amount of coking coal from Australia, and likely to increase at the demise of UK Coal collieries. Coal stocks increased by 103,000 tonnes to 472,000 by end of November. Action Group for Miners lodged their cases at the High Court at the end of October 2005. The Department of Trade and Industry had set up the compensation scheme in the 1980s when it was intended that successful claimants for industrial diseases or accidents would receive 100% of the cash. Geoff Hoon MP (Lab) Ashfield, and Leader of the House of Commons, then met former miners in his constituency regarding the position where some had been charged incorrectly for making claims for work-related injuries or diseases, whilst others were still waiting for their claims to be processed.